This archive holds all posts form October 2007. This year’s PRSA International Conference in Philadelphia was jam packed with sessions on social media topics led by the likes of Phil Gomes, Katie Paine, Josh Hallett, Peter Himler, Rick Murray, and John Bell. But the social media action wasn’t just in the sessions. It was everywhere in the conference. A special conference blog was set up to host posts on the conference sessions. Eric Schwartzman roamed the halls interviewing speakers and participants for special conference editions of his podcast. The air was thick with Twitter traffic as participants posted their impressions of several simultaneous sessions. And of course there was the requisite bloggers dinner on the first evening of the conference which brought together over two dozen bloggers and podcasters. The interview runs just over three minutes and you can watch it here. Danielle Donders is an avid blogger who has found herself on the receiving end of a growing wave of pitches from marketers for products and services. 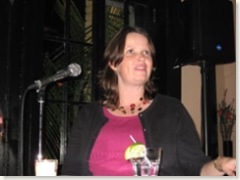 She shared her experience and insights with the Third Tuesday Ottawa attendees last night. 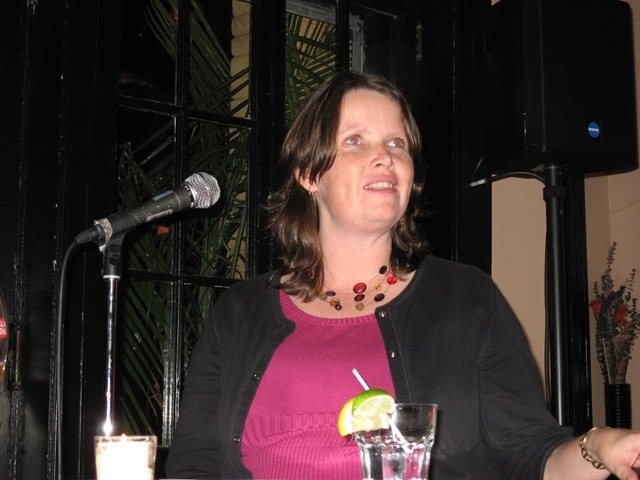 Danielle began her Postcards from the Mothership blog, which she referred to as her “online shrine to parental self absorption,” in January 2005. Nearly three years and more than 950 posts later, she’s still at it. No blog fading for her. And public relations practitioners and marketers definitely seem to care about what Danielle things and writes about. In just the last four months, she’s received pitches for skin lotion, shoes, coffee, head lice cures, three different cell phones, soup, Nestle Quick, recipe exchange site; public service site about breast exams, contests about writing, yogurt, Bounty paper towels, and books. She says that she can really tell who cares about the bloggers they pitch and those that are just carpeting the terrain. For example, “I got an free pass invitation to go to a fitness centre for teens in Los Angeles. I’m a suburban mom in Ottawa with a 3 and 5 year old. They didn’t read my blog. So, I don’t care” about what there’re pitching. Does accepting a product oblige her to be positive about the product? “No. I’m obliged to be polite and reasonable and fair about the product. But if I hated the phone, I’d say so.” Danielle in fact indicated that before the trial with the Motorola phone, she had been offered a trial with a Nokia phone. She found it to be “too much phone and confusing” and she said so. In her “day job”, Danielle works for the federal government. She has parlayed her experience as a mommy blogger into a full time assignment to help her department figure out the intersection between social media and government communications. She believes that social media can put a human face on government. A great presentation from an engaging personality. Thank you Danielle! What do Darren Barefoot, David Jones, Danielle Donders and I have in common? 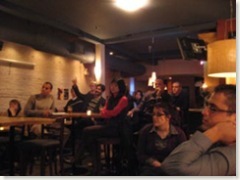 We’re speaking at the Third Tuesday social media meetups this week. If you’re interested in social media and its impact on communication, marketing, community building and society and you’d like to get together with others who share this interest, register to attend Third Tuesday in Toronto, Ottawa or Vancouver. And while you’re at it, why not join the Third Tuesday Facebook group to participate in the discussion before and after the sessions. Third Tuesdays are community driven free events organized by volunteers with support from CNW Group, who underwrite the cost of presentation equipment and venue fees, and Society for New Communications Research. Thank you to both our sponsors. Your help to make these events is greatly appreciated. Gary Shlee, the social media-savvy coordinator of the postgraduate Corporate Communications and Public Relations program at Toronto’s Centennial College has just pulled the wraps off Talk is Cheap – a social media unconference that Centennial will be hosting on November 15. Visit Gary’s blog post for more info and then hop over to the conference Wiki to sign up as a participant or propose a session. Congratulations on the initiative Gary. A great opportunity for experienced PR practitioners to share with PR students and the practitioners of tomorrow. Toronto Star afternoon edition in PDF format. What were they thinking? Add to the current mix downloadable podcast content, the ability to take emails and web content out of the office on BlackBerries and even to use these devices to surf the web for up to the minute content – and it seems to me that the Star is chasing a miniscule set of readers. There are many innovate people at the Star and in the newspaper industry. And they will evolve the medium to compete with the new media. But this initiative by the Star isn’t really a step forward. It smacks too much of simply trying to apply the old model to a new medium. And I can’t believe that will work. Well, news today that the Star has thrown in the towel on the PDF experiment. They’ve replaced it with a mobile edition that will offer the full text of Star stories formatted to be read on the small screen of a mobile device. The main content will be published at 3:30PM “and updated with breaking news and closing market numbers until 4:15.” Readers can subscribe to email alerts that will be delivered to their email boxes at 3:30 and 4:15. So, to the Toronto Star, my compliments for learning from the PDF experience and moving to a mobile platform. But don’t stop there. Add those RSS feeds so that I can receive your news in the mobile format of my choice. If you’re in Toronto on Thursday evening, let’s talk about social media and blogger relations. That’s the topic that IABC Toronto’s Independent Practitioners group have asked me to address at their “Old Media vs. New Media” seminar. If you read my blog, I’d love to see you there and to hear what you think about blogger relations and whether they matter when compared with traditional media relations. Chris Clarke joined Thornley Fallis straight out of school. He was the first person we hired primarily because of his experience in blogging. 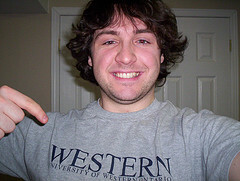 He’d begun his Student PR blog while studying public relations at London’s Fanshawe College. I subscribed to Chris’ blog and read his posts. Over time, I thought that Chris demonstrated passion for PR and a distinctive perspective and voice that would mesh well with Thornley Fallis’ exploration of social media. You can watch a five minute video of my interview with Chris Clarke here. The next Third Tuesday Ottawa has been confirmed for October 15. We’ll hear from Danielle Donders, author of Postcards from the Mothership. 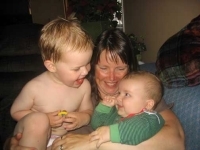 Danielle is an Ottawa communication strategist, social media junkie, and mother of two boys. She’s also a popular “mommy blogger” and has some unique insights into how marketers are approaching the mommy blogging crowd. As always, Third Tuesday admission is free. But please register at the Third Tuesday Ottawa site so that we know that you’ll be joining us and so that you can see who else will be attending. This is a week of change for Thornley Fallis and our family of bloggers. Student PR’s Chris Clarke is leaving us to see what another organization has to teach him. When Chris joined us in May 2006, we were still relatively new to blogging and social media. Thornley Fallis had just over a year of experience with Wikis and blogs. Pro PR was still less than a year old. And Chris had been posting for about three months at Student PR. 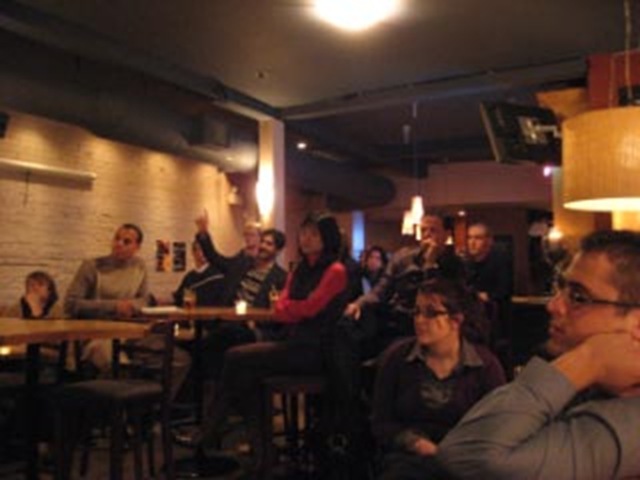 During his time with us, Chris was one of the founding organizers of Third Tuesday Toronto. He also took up the task of producing Inside PR. And he shared his learning experiences through his blog. His posts were often provocative, sometimes controversial, but always worth reading. Of course, even if his day job will be on the other side of town, Chris will never be more than a click away from us here at Thornley Fallis. Chris’ Student PR blog will move from Our Community to TF Alumni on the ProPR and Thornley Fallis sidebar. I know I’ll continue to subscribe to his blog and comment on it. And I’m counting on Chris to continue as one of the founding organizers of Third Tuesday Toronto. I was proud to have Chris Clarke as a member of the Thornley Fallis team. And while he’s leaving us for another day job, he’ll continue to be part of our social media community. And a friend. So, here’s wishing good luck to you, Chris. It’s been a great experience. I’ve learned a lot by working alongside you. And I’ve enjoyed it from beginning to end. May the future bring you only success and happiness. UPDATE: Chris has posted about his plans post-Thornley Fallis. I just returned home from attending BlogOrlando. It was a great experience. I had a chance to learn from presenters like Shel Israel, Tom Biro, Chris Heuer, Geoff Livingston, Laurie Mayers, Jake McKee, Annie Heckenberger, David Parmet, and David Coustan. It also brought me face to face for the first time with people like Connie Reece and Constantin Basturea. All in all, BlogOrlando was one of the best sessions on social media I’ve attended this year. And remarkably, the registration fee was zero. Nothing. Nil. The conference was organized by Josh Hallett and a team of volunteers. The speakers donated their time and covered their own expenses. Truly, BlogOrlando embodies the culture of generosity that underlies the pure spirit of social media. The urge to share with others. To connect. To contribute to the common good. So, a big thank you to Josh Hallett and all the organizers of BlogOrlando and other community driven events like Podcamp, CaseCamp and DemoCamp. You keep the gift economy alive in social media.